The Republican candidate's maverick image obscures his cozy relationship with lobbyists. In early April John McCain held a top-dollar fundraiser at Washington’s Willard Hotel, where President Ulysses S. Grant invented the term “lobbyist.” It was a fitting locale, as the election-reform group Public Campaign noted, since thirty-five of the forty-three hosts for the evening were registered lobbyists. The following week Rick Davis–on leave from his job as a lobbyist to work as McCain’s campaign manager–gave a strategy presentation to lobbyists from the oil, utility and nuclear power industries, soliciting campaign contributions. McCain’s ties to K Street began attracting attention, and a month later two of his key operatives were forced to resign after the press revealed that they’d lobbied for the Burmese dictatorship. A top McCain fundraiser, former Congressman Tom Loeffler, also got his walking papers after lobbying McCain on behalf of Saudi Arabia. In the space of ten days, five McCain lobbyists-turned-staffers left his campaign. Those who remained included senior adviser Charlie Black–formerly one of the most high-profile Republican lobbyists in Washington, who has represented the likes of Iraqi exile Ahmad Chalabi, mercenary contractor Blackwater and Philippine dictator Ferdinand Marcos. One could be forgiven for wondering, Was anyone in McCain’s inner circle not a lobbyist? Coziness between lawmakers and lobbyists is an old story in Washington, but in McCain’s case such entanglements threaten to derail his maverick mystique. After his humiliating involvement in the Keating Five corruption scandal in the late 1980s, McCain worked tirelessly to cultivate a reputation as a chastened reformer. In the following years he made campaign-finance reform–specifically banning unlimited “soft money” donations–a near crusade, working closely with Democratic Senator Russ Feingold and angering many Republicans. Embracing campaign-finance reform became a useful way for McCain to differentiate himself from his earlier incarnation and from the DeLays and Gingriches and Bushes who were corrupting the Republican Party. Yet his second run for the presidency, with its emphasis on courting conservative Republicans, highlights the fact that McCain has morphed back into a quintessential creature of Washington–just another politician who uses the issue of reform when it suits his agenda. For McCain, there is no better example of how the image of reform has obscured the intersection of corporate donations and DC lobbyists than the Reform Institute. A nonprofit with an Orwellian name, the institute was founded by McCain and his allies a year after his failed 2000 campaign. Billed as “a non-partisan election reform organization whose Honorary Chair is Senator John McCain,” the institute wasn’t really nonpartisan, and McCain was far more than an honorary chair. “It was predicated on McCain’s political connections,” says Robert Crane of the JEHT Foundation, a social justice organization in New York and one of the Reform Institute’s past funders. “It wasn’t an independent entity.” To be sure, the institute did some good work at the state level in support of clean elections, but it always remained a John McCain protection agency. The Reform Institute paid for McCain to give speeches and host town hall meetings, touted him in press releases and cultivated his donor list. The group was housed in the same offices as McCain’s PAC, his re-election committee and Rick Davis’s lobbying firm, Davis Manafort, which represented telecommunications and gambling interests along with foreign governments like Nigeria and Ukraine. The staff included McCain’s campaign manager, Davis, as president; his chief fundraiser, Carla Eudy; and his Internet consultant, Rebecca Donatelli. It was incorporated by McCain counsel Trevor Potter, with seed money from former Merrill Lynch CEO Herb Allison, McCain’s finance chairman in 2000. McCain was chairman of the board from 2001 until 2005. Meanwhile, Davis earned $395,000 for three years of work, Eudy took in $294,000 as a consultant and treasurer, and McCain policy guru John Raidt made $145,000 in 2006, to give one example of how the Reform Institute padded the coffers of McCain’s political brain trust. At the outset, the organization’s primary purpose was defending McCain’s campaign-finance legislation, McCain-Feingold, before Congress, the Federal Election Commission and the Supreme Court. But even as McCain was pushing that bill, he was also gaming the campaign-finance system. The fact that a registered lobbyist was running an entity called the Reform Institute was not the only reason the group raised eyebrows in Washington. As a 501(c)(3) nonprofit, the Reform Institute could accept the kinds of unlimited tax-deductible contributions that McCain’s PAC and re-election committee could not. Longtime McCain donors like California businessman William Bloomfield, former Houston Astros owner John McMullen and businessman and former diplomat Robert Stuart gave more than $50,000 each to the institute. According to Citizens for Responsibility and Ethics in Washington, the largest donors to the institute also gave a combined $305,985 to McCain and his PACs. More unlikely funders included liberal foundations eager to find GOP allies on campaign-finance reform, like George Soros’s Open Society Institute, the San Francisco-based Tides Foundation and the David Geffen Foundation. A number of donors who gave almost exclusively to Democrats also wrote large checks. So did wealthy executives who saw that giving to a McCain-affiliated nonprofit could be good for business. This category included insurance giant AIG (formerly run by McCain backer Hank Greenberg) and television interests like Univision, Cablevision and Echosphere. As the two-time chair of the Senate Commerce Committee, McCain enjoyed unprecedented access to the telecommunications industry. And Davis the lobbyist was the perfect conduit: between 2002 and 2005, for example, Verizon paid Davis Manafort $640,000 in lobbying fees. The contract began after McCain took over the committee and ended when he gave up chairmanship. At the same time Davis aggressively sought telecom donations for the Reform Institute. On two occasions he solicited $100,000 from Cablevision after CEO James Dolan testified before McCain’s committee and McCain wrote letters to the Federal Communications Commission on Cablevision’s behalf. The donations invited scrutiny from the press: McCain Allies Want Reform (And Money), the New York Times said in March 2005. That July McCain formally resigned from the board, citing “negative publicity,” and Davis stepped down as president. Yet unscrupulous donations from industries McCain was supposed to be monitoring were only part of the reason the Reform Institute became controversial. Even before the dubious fundraising came to light (the institute also twice failed to disclose the names of major donors on its tax returns, a potential violation of IRS law), McCain and Davis’s my-way-or-the-highway approach to campaign-finance-reform legislation rubbed many in the reform community the wrong way. After the ban on soft-money contributions, McCain and the Reform Institute became strong proponents of regulating so-called 527 political advocacy groups, which arose because of a loophole in the McCain-Feingold law. The 527s were initially thought to benefit Democrats after liberal megadonors such as Soros and Peter Lewis funded the likes of America Coming Together and the Media Fund. In 2004 McCain introduced legislation to ban 527s, which Common Cause and the Brennan Center for Justice opposed, fearing McCain’s bill would hamper standard activities like voter registration drives. According to Cliff Schecter’s book The Real McCain and an interview that former Common Cause president Chellie Pingree gave to the Portland Press Herald in Maine, where she is now a Democratic candidate for Congress, McCain and Davis called funders and members of the Common Cause board and demanded they fire Pingree or rein her in. Such a move was all the more remarkable because for years the organization led the field operation for McCain-Feingold, building grassroots support for the legislation. “My understanding from people close to the situation is that Common Cause, under Chellie, was deciding to work on comprehensive public financing of elections and not on Senator McCain’s 527 policy,” says Nick Nyhart of Public Campaign, which has worked closely with the Reform Institute. “McCain and Davis objected and wanted her out. I’ve never heard of a public official, or an associate, trying to go after an ally in the nonprofit sector like that.” The McCain campaign has declined to respond. 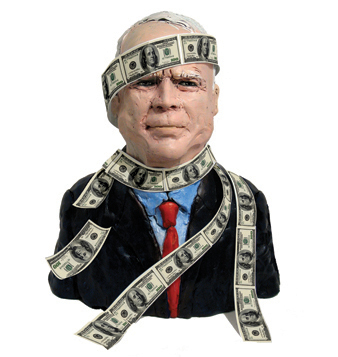 The Reform Institute has sought to cultivate the image of a post-McCain identity. “It’s very independent of McCain,” says executive director Cecilia Martinez, who previously worked to pass clean elections legislation in Arizona. But though McCain and Davis officially departed in 2005, many McCain loyalists remained involved with the institute and its advisory committees, including top fundraisers, former staffers and political allies of the Arizona senator. The institute still closely resembles a McCain administration in exile and, predictably, takes up the same issues that McCain does. In 2005, as Ken Silverstein of Harper’s noted, the institute added “climate stewardship” to its agenda, around the same time the Lieberman-McCain Climate Stewardship Act was reintroduced in the Senate. The institute’s climate initiative was led by John Raidt, McCain’s top policy adviser, and a grant for the work came from Environmental Defense, an enthusiastic backer of McCain’s climate change bill. The Reform Institute began reaching out to the nuclear power industry, including the Nuclear Energy Institute, the industry’s main lobbying arm. Not surprisingly, McCain also happens to be an energetic proponent of nuclear power, which he recently called “one of the cleanest, safest and most reliable sources of energy on earth.” Today the institute’s energy project is overseen by Ken Nahigian, a former counsel to McCain on the Commerce Committee whose brother, Keith, directed media strategy for McCain in 2000. Together the Nahigian brothers run a consulting firm whose clients include the Energy Department, the National Security Council and, yes, the Reform Institute. Roll Call listed the Nahigian brothers as part of a “stable of K Street lobbyists [who] have help[ed] pad McCain’s campaign coffers.” Other members of the Reform Institute’s Energy Advisory Committee include David Pottruck, former CEO of Charles Schwab and a top fundraiser for McCain; Matthew Freedman, a former lobbying partner of Rick Davis; and Marc Spitzer, a Bush appointee to the Federal Energy Regulatory Commission who is a friend, fundraiser and former tax adviser to McCain. The institute’s work has also reaped political benefits for McCain in the areas of immigration reform and outreach to Hispanic evangelical communities. In 2006 the institute hired Juan Hernandez, a former deputy to Vicente Fox, president of Mexico from 2000 to 2006. Hernandez, who now works on Hispanic relations for the McCain campaign, courted Hispanic evangelical organizations, a growing swing constituency and a ripe target for McCain. The group hosted a Capitol Hill press conference featuring the Rev. Sam Rodriguez of the National Hispanic Christian Leadership Conference, an umbrella of 15 million Hispanic Christians, who was described as “the Karl Rove of Latino evangelical strategy” by the Chicago Tribune. Another ally was Marcos Witt, Hispanic pastor at Joel Osteen’s Lakewood Church in Houston, the country’s fastest-growing megachurch. Members of the institute’s Immigration Reform Advisory include Lindsey Graham, McCain’s closest friend in the Senate; Eric Rojo, a member of the US-Mexico Chamber of Commerce who has donated to McCain; and Kim Binkley-Seyer, a former deputy to Jeb Bush in Florida. Cecilia Martinez says it’s natural that people close to McCain, like Lindsey Graham, would take an interest in the Reform Institute. “We’re a home for centrists, moderates and conservatives,” she says. “Where else are they going to go?” In fact, a lot of them have gone to work on McCain’s campaign, including former institute staffers Davis, Eudy, Potter, Hernandez; former spokeswoman Crystal Benton, who now does press for McCain; and board member Pam Pryor, who was a chief of staff for conservative Oklahoma Congressman J.C. Watts and is the national coordinator of Women for McCain. “It’s a question funders were worried about,” said the JEHT Foundation’s Crane. “Is this a political arm for John McCain?” In fact, much of the group’s foundation funding has since dried up. Donors who once gave to the Reform Institute are instead raising money directly for McCain’s campaign. Perhaps that’s one reason the institute decided to focus on homeland security, a potentially lucrative source of post-9/11 funding. The institute’s newest obsession is “resiliency”–the latest buzzword in homeland security circles. Resiliency was an obscure engineering term for how systems bounce back from disruption, until it was popularized by Council on Foreign Relations scholar Stephen Flynn and embraced by politicians and industry. This winter Rudy Giuliani titled his homeland security blueprint “The Resilient Society.” For business, invoking resiliency has been a shrewd way to avoid government security mandates, as the chemical industry did after 9/11, thwarting Congressional attempts to toughen standards at chemical plants by arguing, under the banner of resiliency, that they could monitor themselves better than the government could. Promoting a laissez-faire approach to regulation under the guise of protecting the homeland may be one reason the private sector loves resiliency; the Reform Institute’s recent New York symposium on the topic attracted the likes of PR behemoth Burson-Marsteller, Bank of America, NASDAQ, Shell Oil, Alcatel-Lucent, Sprint, AT&T, Motorola and Verizon. Resiliency also presents new business opportunities and political connections for members of the Reform Institute’s Homeland Security Advisory Committee. The institute’s homeland security director, Robert Kelly, is also chair of the homeland security division at the National Defense Industrial Association, a lobbying arm for military contractors like Bechtel and Halliburton. Kelly’s vice chair, Rich Cooper, a fellow institute adviser, lobbies on resiliency issues for the American Society of Mechanical Engineering. A third member of the homeland security task force, David McIntyre of TriWest Healthcare in Phoenix, is a former McCain aide and longtime financial backer who is one of “several McCain loyalists [who] arise as possible Arizona appointees” should McCain win in November, the Phoenix Business Journal reported. Homeland security is just one area where the institute reflects ties between McCain and the business/lobbying community. Economic policy adviser Joseph Schmuckler, an executive at the investment bank Mitsubishi UFJ, is McCain’s campaign treasurer and a “Trailblazer” who’s raised between $100,000 and $250,000 for McCain. Another Reform Institute economic policy adviser, Al Zapanta, president of the US-Mexico Chamber of Commerce, is both a “Virginia Business Leader for McCain” and a member of the senator’s Hispanic Advisory Board. Donnelly notes that McCain has pledged to appoint Justices to the Supreme Court like John Roberts and Samuel Alito, who are critics of McCain-Feingold. In a nod to the hard right, the chairs of his campaign’s judicial advisory committee are conservative Senator Sam Brownback and former Bush Administration Solicitor General Ted Olson. In 2007 Olson filed an amicus brief on behalf of Senate minority leader Mitch McConnell–arguably the number-one foe of campaign-finance reform–to overturn a key aspect of the McCain-Feingold bill in Wisconsin Right to Life v. McCain. The Supreme Court concurred in a controversial 5-to-4 decision in June 2007. So McCain’s chief legal adviser has argued against McCain’s chief legislative accomplishment. That’s as ironic as the name of the Reform Institute.